Wyvetta Bullock (right), ELCA executive for administration in the Office of the Presiding Bishop, and Jennifer Baskerville-Burrows (left), bishop of the Episcopal Diocese of Indianapolis, led the Monday eucharist service at the 16th ADLA biennial assembly. 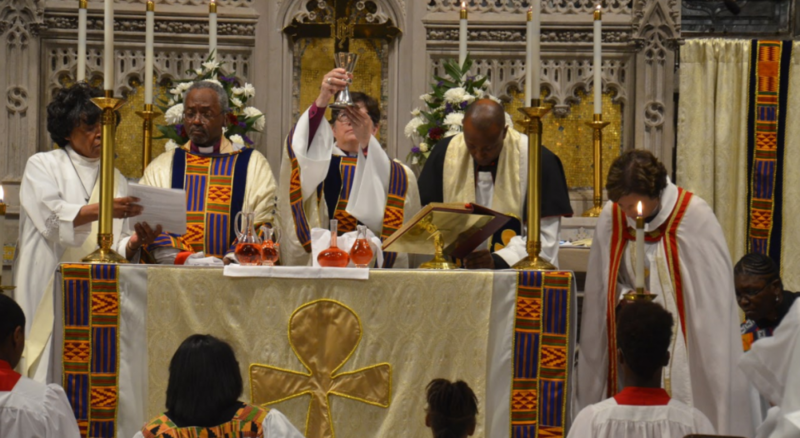 Photo: Jesse W. Brown Jr.
ELCA Presiding Bishop Elizabeth Eaton (center, with cup) and Episcopal Church Presiding Bishop Michael Curry (second from left) preached and served together at the assembly’s closing worship. Photo: Jesse W. Brown Jr. 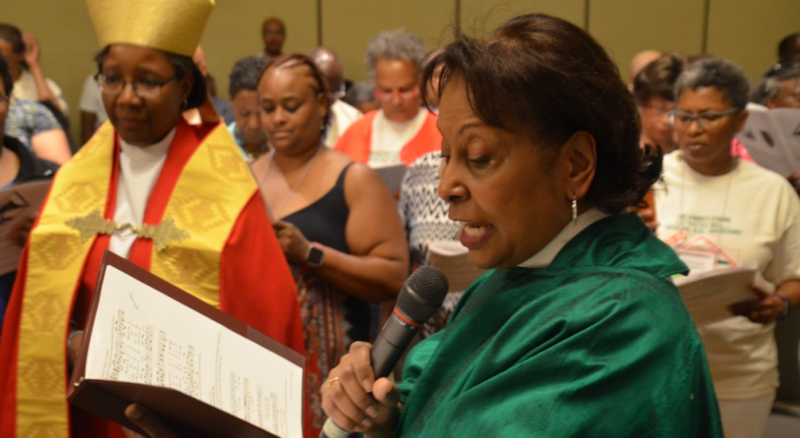 The African Descent Lutheran Association (ADLA) and the Union of Black Episcopalians (UBE) gathered for a joint assembly July 22-26 in Cherry Hill, N.J., commemorating ADLA’s 30th anniversary and the 500th anniversary of the Reformation. 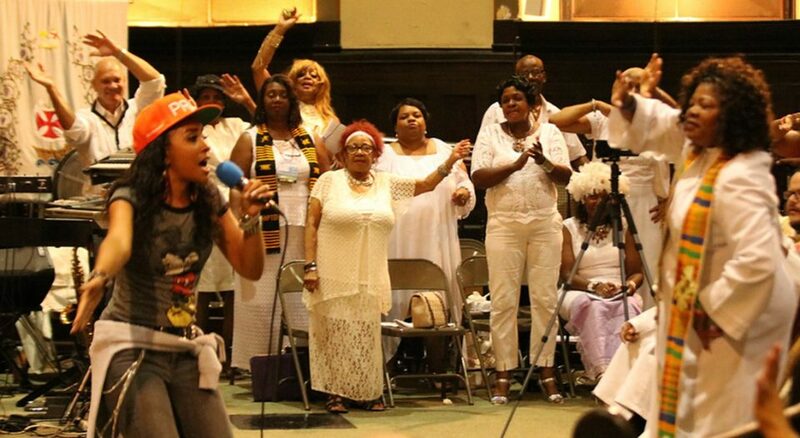 Under the theme “Like a Mighty Stream, Let Justice Roll: Absalom, Jehu, and Beyond,” notable black thought leaders challenged participants’ minds and missions throughout the 16th ADLA biennial assembly. ELCA Presiding Bishop Elizabeth Eaton and six ELCA synodical bishops were also present at the assembly. Eaton and Episcopal Church Presiding Bishop Michael Curry served together at the assembly’s closing worship, with Eaton presiding and Curry preaching. The assembly elected Angela Shannon as national vice president and re-elected Tracey Beasley as national treasurer. ADLA’s ministerium elected Jonathan Hemphill as chaplain. They join Lamont Anthony Wells, national president; Krystal Hamlett, corresponding secretary; and Annette Sample, recording secretary, as officers. The assembly also acknowledged the re-establishment of an ADLA chapter in Atlanta, which will join other chapters in Baltimore, Chicago, Cleveland, Los Angeles, New York City and Philadelphia. In addition to members connected to these chapters, there are also national ADLA members across the country. As members returned home from the assembly, they were charged with living out ADLA’s objectives, presented by Wells: 1. connecting across the African Diaspora; 2. strengthening leadership and congregations; 3. focusing on health and wellness; and 4. developing ecumenical relationships. 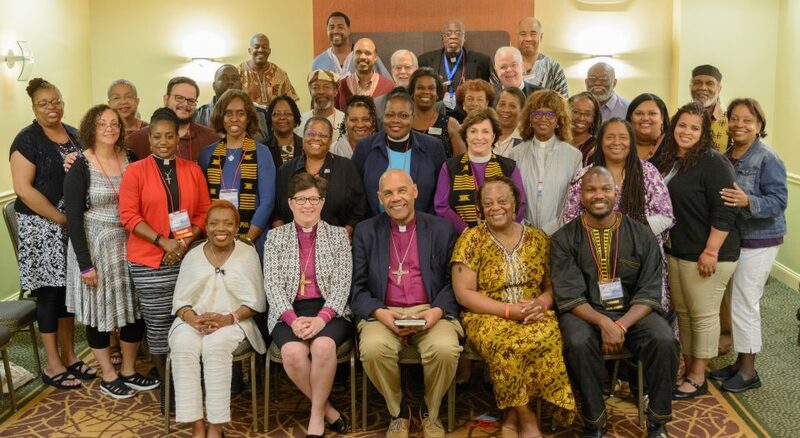 ADLA members left the assembly renewed and charged with direction to continue the work Lutheran leaders of African descent have been engaged in for 30 years. Tiffany C. Chaney serves as pastor/mission developer of Gathered by Grace, a newly forming Synodically Authorized Worshipping Community of the ELCA, located in Montgomery, Ala., and is communications chairperson for the African Descent Lutheran Association.